The Shravani Mela is celebrated at the Baba Baidyanath Dham – the Lord Shiva Temple at Deogarh in Jharkhand with great devotion. Believed to be a place where prayers never go unanswered, millions of Lord Shiv devotees from around the world undertake a pilgrimage from Sultanganj to Baba Baidyanath Temple during the auspicious month of Shravan. 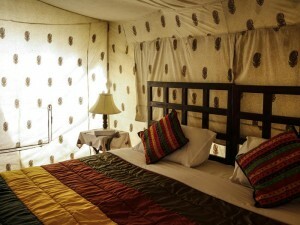 Ensuring a warm and cosy stay are the plush interiors of the tent accommodation. 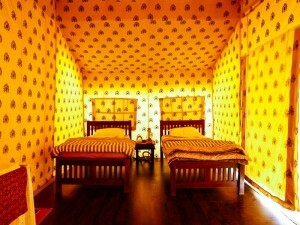 With all the basic amenities that take care of your comfort, you will be free to be immersed in devotion and prayer. Amenities: Equipped with an AC &amp; heater, well-appointed rooms, a double bed, an attached bathroom and a sitting area with a centre table and two chairs. Amenities: Equipped with an AC & heater, well-furnished interiors includes two single beds, a centre table with two chairs,and an attached bathroom. 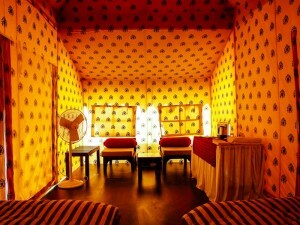 Amenities: Non-AC Deluxe Tents, two single beds, an attached bathroom, a centre table with two chairs and a fan. **Service Tax Applicable till 30th June is 9%. The Shravani Mela is celebrated in the month of Shravan that has great importance at Baba Baidyanath Dham – the Lord Shiva Temple at Deogarh in Jharkhand. Millions of Lord Shiva devotees from around the world undertake a pilgrimage from Sultanganj to Baba Baidyanath Temple. The flow of the Holy River Ganga in Sultanganj is northward direction, the only place where this happens. Devotees collect the holy water from The River Ganga and carry it to the temple to bathe the Shivling which is one of the Jyotirlingam – twelve temples dedicated to Lord Shiv. By road the distance from Babadham (Deoghar) to Patna is 252 kms and from Babadham (Deoghar) to Ranchi is 251 kms. Approximate journey time is 6 hrs both from Patna and Ranchi to Babadham (Deoghar). Passenger buses run regularly from Ranchi and Patna to Deogarh. (iii) Deoghar-Sarath- Chitra-Jamtara- Chitranjan-Maithon- Dhanbad-Bokaro- Ramgarh-Ranchi. The nearest railway station is Jasidih (10 kms) on Howarah – Patna – Delhi line. Behind Rajpath Club, Off SG Highway. Ahmedabad – 380054, GUJARAT, INDIA.